"Apoise" by Lürssen designed together with Espen Oeino, is a 67 metre motor yacht. The yacht's volume is emphasised by its 12.80 m beam, thanks to which the interiors were easily divisible into particularly spacious compartments. 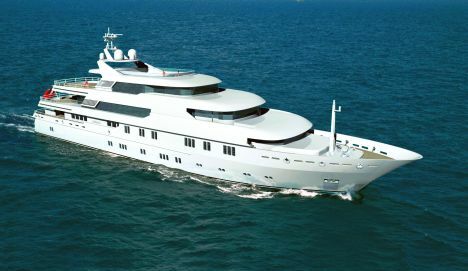 Conceived as a charter cruiser, "Apoise" hits the market with the latest nautical technology geared in particular for entertainment purposes and with an unusual amount of cabins. On the lower deck in fact there are 4 cabins referred to as suites on board with king size berths and each with its own ensuite bathroom. The yacht owner's master cabin, instead, is on the main deck which covers 130 sq. metres. In this area, the German yacht groups some of its areas for socializing such as the main saloon with its adjacent dining area and catchy entrance enhanced by a glass circular lift. The "bridge deck" also hosts, aside from another VIP cabin, a saloon which goes right across the motor yachts's beam, another two dining areas, an internal one and an external one on the deck's extension. One of the singular aspects on board "Apoise" is the distribution of the fair number of areas in common which range from the cool air conditioned internal ones to the open air ones. In between decks there are sunbathing areas with the usual equipment for sun and cocktail lovers, a pool on the main deck with a bar whereas on the upper deck there is a gym another bar and a Jacuzzi. On the top deck of course one can admire the view at 360°. Top declared speed: 16 knots.